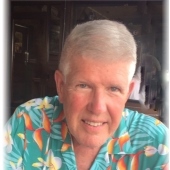 Ward Andrew Mitzel, 76 of Zanesville died at 10:31 P.M. Thursday, August 16, 2018 at the Ohio State University Medical Center following injuries sustained in an automobile accident. He was born on Tuesday, January 27, 1942 in Ohio the son of Carl Mitzel and Nancy Ward Mitzel Hurter. Ward was raised in Rocky River, Ohio, western suburb of Cleveland. He attended College at Denison University and the University of Cincinnati where he graduated with mathematics major. He also proudly served his country as a United States Marine. He was the Director of Computer Services at Inter-Ocean Insurance, a firm based in Cincinnati. He later was the innovative programmer for The Ohio River Company where he created systems that tracked the company’s barges and tugboats and provided detailed information to the home office in Cincinnati. Upon retirement he moved to Zanesville in 2002 and remodeled, owned and managed the Z-Venue Restaurant. He had been a member of the Putnam Historic Society. In retirement, he remodeled homes employing his expertise in all phases of construction. He enjoyed showing others the skills he had learned. He enjoyed playing bridge, entertaining and especially telling a great joke. He is survived his wife, Ann Slack Mitzel; a son, Adam (Trisha) Mitzel of Cincinnati; 3 grandchildren, Rylan, Weyton & Hudson; a step-daughter, Amy (Brock) Novak of Columbus; a brother, David Mitzel of Zanesville; a niece, Sarah Ettelman and a nephew Ward Kieffer Mitzel. Ward was preceded in death by his parents and a brother John Mitzel. A time for sharing stories, enjoying fellowship & of course telling a joke or two will be held from 2:00 PM to 4:00 PM Saturday, August 25, 2018 at the Zanesville Yacht Club. In lieu of in flower, memorial contributions can be made to the Zanesville Yacht Club or Muskingum County Center for seniors. The Bryan & Hardwick Funeral Home, 2318 Maple Ave. Zanesville is in charge of the arrangements. To share memories and condolences with Ward’s family please click on the Guest Book link on this page.